Delicious, vital and pure drinking water, good energy in your house and protection against radiation. Drinking delicious vital water from your own tap with the powerful Leliveld water vitalizer. All products in our webshop we sell because we use or experienced them ourselves to our full satisfaction. Water that flows in nature is vital by nature, its structure is not affected. It doesn't matter where your drinking water comes from, water loses its vitality throughout the long way to your home. The quality and flavour of or tap water is influenced negatively by harmful substances that it touches and because it doesn't flow like it does in nature any more, but is trapped in water pipes. The Leliveld vitalizer, placed in your water main, gives your water back its natural structure and vitality. 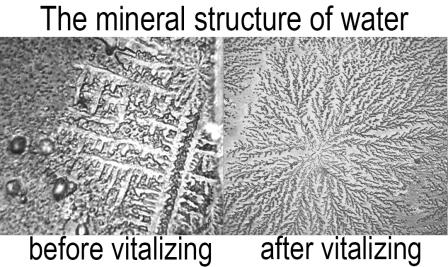 Vitalized water once again shows its organized structure. 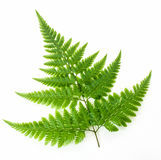 These organized structures can be found throughout all of nature, for example in the leaf of a fern. Vitalizing water is therefore the source of healthy drinking water. By vitalizing water the minerals are better dispersed and accessible. The water regains life force, harmony and softness. Vitalized water is better absorbed by the body. Moreover, you don’t need to drink water from (plastic) bottles anymore, vital water just flows from your tap. The vitalizers work by transferring frequencies that can be found in spring water of the highest qualities as well as sending out frequencies that improve all-round and specific resilience. "After the installation of the adjustable watervitalizer: About the change of energy; now I'm happy to go showering, thereafter my skin feels soft. Have no burden of irritation in my wrists. The water has a good taste. While at home we are much nicer each other. So far only positive in all aspects. " Read the experiences of users of our products. A vitalizer on the water main doesn't just vitalise the water and the house, but also the complete energy of its environment. This can improve the wellbeing of people, but there are more reasons to use a watervitalizer for the entire house. The vitalizers and all other Leliveld products are quality products. They are safe, solid and made of high quality stainless steel. So they cannot break, handle the water pressure easily and are free of maintenance. The Leliveld vitalizer is known for their staying deep and powerful vitalising effects. The energy of the vitalizer is also safe and gives extra support on all levels. By using a vitalizer, your water will become healthier and you will drink more water without any effort. By drinking more water, you become more conscious of your own feelings and start living from your emotion. The energy of the vitalizer creates a powerful field of energy that feeds you and your environment. Even after use, the vitalizer has a positive effect on the environment. The vitalizer transforms the harmful radiation in the water and the body, solving disruptions in your body and energy. This reliefs your body and allows it to find its natural balance again! Flavourful and healthy highly vital water that is also fantastic to shower with. Moreover, vital water creates a Bovis (life energy) of over 100.000! We offer a three month satisfaction guaranty on small vitalizers and a guarantee of a full year for main water line vitalizers! If you also de-calcify and filter your water, it will get the highest quality of drinking water, that tastes like water fresh from a glacier! If you have any questions about the products, the installation of a vitalizer on your water main, the uses and advantages, please contact us. We are happy to help you out with personal advice. Information about the optimal combination of water treatments to achieve the best drinking water, like de-calcification, filtering and vitializing. The Leliveld vitalizer is used by tens of thousands of satisfied people.